In a repeat of yesterday's race two, the RSF-backed driver made another strong getaway to launch himself up into second to shadow team-mate and race winner Felix Rosenqvist all the way to the finish. Once again Ferrari Academy driver Lance Stroll completed the Prema 1-2-3. As per yesterday the safety car put in an early appearance while the aftermath of an Antonio Giovinazzi triggered collision involving Maximilian Gunther and Markus Pommer was cleared. But once again Rosenqvist mastered the restart to take another comfortable victory ahead of Jake Dennis who was never able to get close enough to trouble his team-mate. 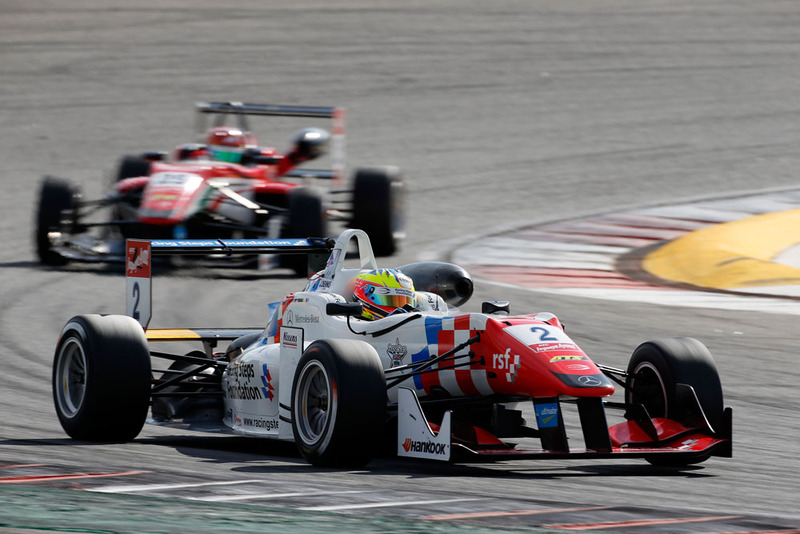 The Prema duo was separated by 1.168s at the finish with Formula 3 rookie Stroll following on a further five seconds adrift. Rosenqvist's main title rivals Giovinazzi and Charles Leclerc finished eighth and seventh respectively. The pair's demise leaves erstwhile points-leader Giovinazzi 34.5 adrift of the Swede at the head of the table while Leclerc, in third, slips to 53.5 behind. A third podium finish of the weekend for race one winner Dennis moves him to within 15.5 points of the Monegasque with six races to go.